The October 2010 Daring Bakers challenge was hosted by Lori of Butter Me Up. Lori chose to challenge DBers to make doughnuts. She used several sources for her recipes including Alton Brown, Nancy Silverton, Kate Neumann and Epicurious. I have been wanting to create a new doughnut recipe so the timing was perfect. As the weather is cooling off, all I could think about was making a batch of apple cider doughnuts. The great thing about developing a new recipe there is a lot of trial and error until the perfect recipe happens. This recipe for Black Cardamon Doughnuts with Warm Apple Cider Glaze is cozy and inviting. Every bite made me feel like Fall was wrapping its arms around me. This year has flown by without many Daring Baker’s Challenges. There are a few reasons but the number one being time. We have been overwhelmed this year and unfortunately, time has not been on our sides. I was listening (reading, spying) to some chit-chat among some of my favorite European Foodies the other morning and they were busy kneading, baking, enjoying sweet smells from the oven. I was intrigued and butted in their conversations – what was going on and how could I be part of it. Jamie, was the first to gently nod me by saying it was the Daring Bakers challenge and it was doughnuts this month. I love doughnuts. I love all sorts, yeast ones, cake ones, sweet, a little savory, all of them! I have yet to find the perfect one in the bay area. I am not actively searching but when I run across a doughnut shop, I sometimes sneak in and grab one. My biggest doughnut time is when we were in Boston. Yes, I am a huge fan of the coconut cake doughnut holes at Dunkin Doughnuts. It is a quilty pleasure. But, I really prefer a nice fluffy yeasty doughnut with a little glaze. After reading the challenge instructions I decided to go with Alton Brown’s yeast doughnut recipe. Easy and it would not take up my entire day. I did make a few changes – used half buttermilk in place of whole milk and used freshly grated black cardamon instead of nutmeg. The recipe is really simple and it rises perfectly. Even frying them was simple – even though I did over do it by a few minutes. I finished the recipe off with a warm apple cider glaze, which was perfectly light and not overly gooey. I loved the recipe as it was easy; but, you have to eat them right away. You cannot save them until the next day or the next, just not that great. They are meant to be eaten hot, warm and fluffy! The recipe is easy enough to start early in the morning, just in time to have warm fluffy doughnuts on the table by a proper brunch time. 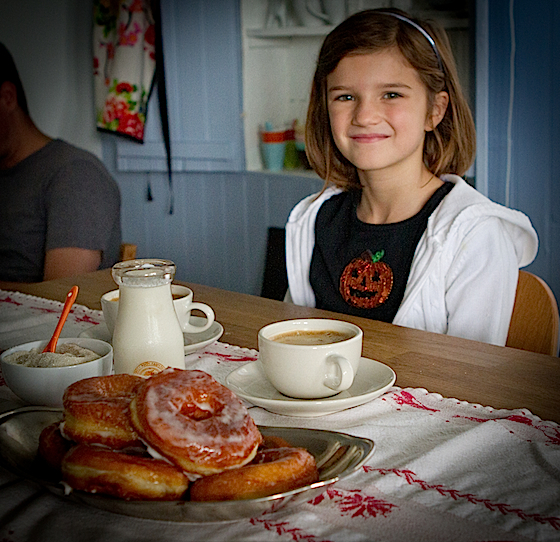 Ella came over to help with the food styling and shooting (as well as taste testing) of the doughnuts. She was an amazing help with setting up and shooting the doughnuts! She gave the recipe a two thumbs up! Place the milk, buttermilk, and butter in a medium saucepan and heat over medium heat just until warm enough to the butter. Set aside. In a small bowl, sprinkle the yeast over the warm water and let dissolve for 5 minutes. After 5 minutes, pour the yeast mixture into the large bowl of a stand mixer and add the milk mixture, first making sure it has cooled to lukewarm. Add the eggs, sugar, salt, cardamom, and half of the flour. Add the remaining flour, combining on low speed at first, and then increase the speed to medium and beat well. Change to the dough hook attachment of the mixer and beat on medium speed until the dough pulls away from the bowl and becomes smooth, approximately 3 to 4 minutes. On a well-floured surface, roll out dough to 3/8-inch thick. Cut out dough using a 2 1/2-inch doughnut cutter. Set on a floured baking sheet, cover lightly with flour sack towel and let rise for 30 minutes. Preheat the oil in a deep fryer, Dutch oven or deep frying pan to 365 degrees F.
Gently place the doughnuts into the oil, 3 to 4 at a time. Cook for 1 minute per side. Transfer to a cooling rack placed in baking pan. Allow cooling for 15 to 20 minutes prior to glazing, if desired. Dip doughnut into glaze, place on a cooling rack, glaze side up and let sit about 10 minutes. Heat apple cider in a small saucepan until warm. Sift powdered sugar into a medium mixing bowl. Add the warm cider. Whisk until smooth, about 3 minutes. Be sure to check out the Daring Baker’s blogroll, I am sure they will fatten you up really well! 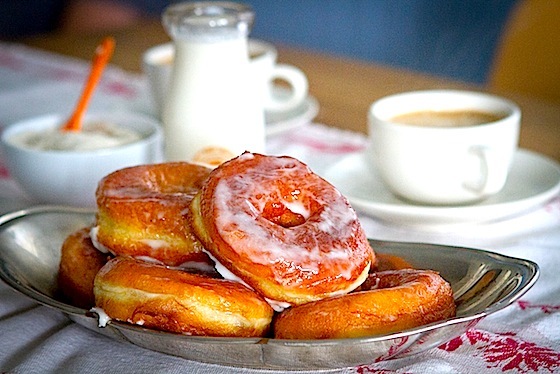 16 Responses to "Black Cardamon Doughnuts with Warm Apple Cider Glaze"
Oh yum! The glaze takes these babies over the top! Now these look like ones that I would try, even not being a big fan I love the flavours. Ella is a lucky little lady! These doughnuts look fabulous! I'd love to have one of these for an afternoon snack! Ella is a lovely looking child. Yes the yeast doughnut recipe is wonderful but needs to be eaten straight away. Lovely photos well done on this challenge. Cheers from Audax in Sydney Australia. They look delicious and cardamom sounds like a very fragrant alternative to the nutmeg! I really, really want these. Ella is too cute! Your doughnuts look great! And your little helper is very cute. :) Awesome job on the challenge. Of all the sweets, doughnuts are probably at the bottom of my list. Just too greasy for me. BUT. I would gladly sample some of these babies warm from your kitchen. Oh so delish do-nuts!! and the last pic is the best! Fantastic flavour combinations. I love the use of cardamon. I’d love for you to submit one of your beautiful photos, and a link to your post, to my new baking photo gallery showcasing the best baking, sweets and desserts on the web. Oh man, homemade donuts. I've been seeing them everywhere these days! Inching closer to trying to make them myself. Great meeting you a few weeks go, btw! Been enjoying reading your blog. Cardomon is one of my favorite spices. Never thought of using it in donuts! LOVELY!